California is the leading producer of tomatoes, especially for the processing market (CDFA, 2017). Tomato is the 9th most important commodity in California valued at $1.71. Processed tomatoes are ranked 6th among the exported commodities with a value of $813 million. While good nutrient management is necessary for optimal growth, health, and yields of any crop, certain products that contain minerals, beneficial microbes, biostimulants, and other such products are gaining popularity. These materials are expected to improve crop health and yield, impart soil or drought resistance, induce systemic resistance, or improve plant's immune responses to pests, diseases, and other stress factors (Berg, 2009; Bakhat et al., 2018; Chandra et al., 2018; Shameer and Prasad, 2018). 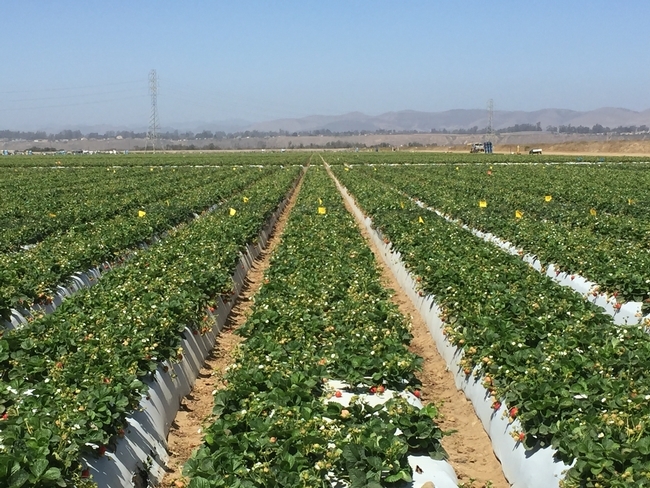 Maintaining optimal plant health through nutrient management is not only important for yield improvement, but it is also an important part of integrated pest management strategy as healthy plants can withstand pest and disease pressure more than weaker plants and thus reduce the need for pesticide treatments. 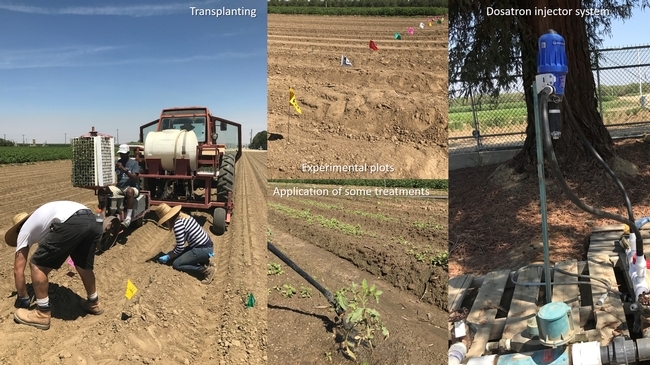 Experimental plots, transplanting, and treatment details. 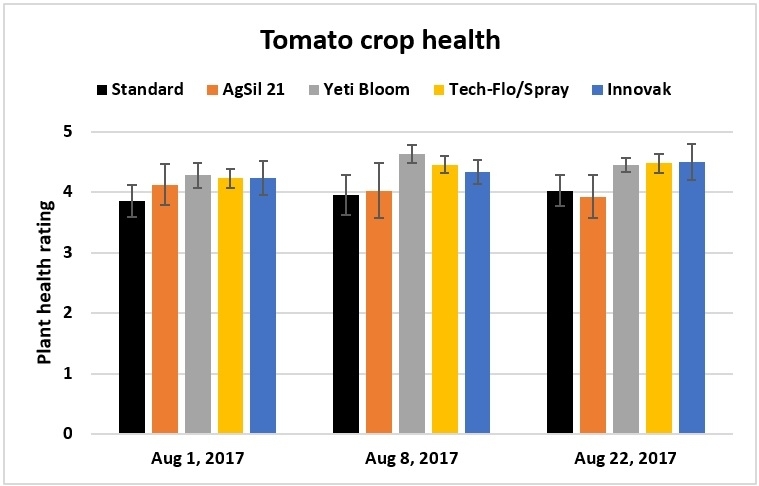 A study was initiated in the summer 2017 to evaluate the impact of various treatment programs on tomato plant health and yield. Processing tomato cultivar Rutgers was seeded on 7 June and transplanted on 18 July, 2017 using a mechanical transplanter. Monoammonium phosphate (11-52-0) was applied at 250 lb/ac as a side-dress on 7 August as a standard for all treatments. Since planting was done later in the season, crop duration and harvesting period were delayed due to the onset of fall weather. Plots were sprinkler irrigated daily or every other day for 3-4 hours for about 2 weeks after transplanting. Drip irrigation was initiated from the beginning of August for 12-14 hours each week and for a shorter period from mid October onwards. There were five treatments in the study including the standard. 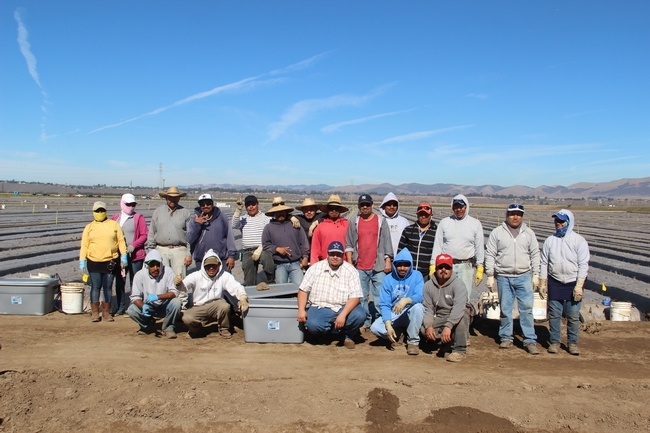 Each treatment had a 38” wide and 300' long bed with a single row of tomato plants. Treatments were replicated four times and arranged in a randomized complete block design. Different materials were applied through drip using a Dosatron injector system, sprayed at the base of the plants with a handheld sprayer, or as a foliar spray using a tractor-mounted sprayer based on the following regimens. AgSil® 21 at 8.75 fl oz/ac in 100 gal of water through drip (for 30 min) every 3 weeks from 31 July to 13 November (6 times). AgSil 21 contains potassium (12.7% K2O) and silicon (26.5% SiO2) and is expected to help plants with mineral and climate stress, improve strength, and increase growth and yields. Yeti BloomTM at 1 ml/gallon of water. Applied to the roots of the transplants one day before transplanting followed by weekly field application through the drip system from 7 August to 13 November (15 times). Yeti is marketed as a biostimulant and has a consortium of beneficial bacteria - Pseudomonas putida, Comamonas testosterone, Citrobacter freundii, and Enterobacter cloacae. Yeti Bloom is expected to enhance the soil microbial activity and helps with improved nutrient absorption. Tech-Flo®/Tech-Spray® program contained five products that supplied a variety of macroandmicro nutrients. Products were appliedthroughdrip (for 30 min) at the following rates and frequencies in 300gal of water. Tech-Flo All Season Blend #1 1 qrt/ac in transplant water and again at first bloom on 28 August. Tech-Flo Cal-Bor+Moly at 2 qrt/ac at first bloom on 28 August. Tech-Flo Omega at 2 qrt/ac in transplant water and again on 11 September (2 weeks after the first bloom). Tech-Flo Sigma at 2 qrt/ac on 11 September (2 weeks after the first bloom). Tech-Spray Hi-K at 2 qrt starting at early color break on 25 September with three follow up applications every two weeks. Innovak Global program contained four products. ATP Transfer UP at 2 ml/liter of water sprayed over the transplants to the point of runoff just before transplanting. Three more applications were made through drip (for 30 min) on 7 and 21 August and 4 September. This product contains ECCA Carboxy® acids that promote plant metabolism and expected to impart resistance to stress factors. Nutrisorb-L at 40 fl oz/ac applied through drip (for 30 min) on 31 July, 14 August (vegetative growth stage), 4 and 18 September, and 2 October (bloom through fruiting). Nutrisorb-L contains polyhydroxycarboxylic acids, which are expected to promote root growth and improve nutrient and water absorption. Biofit®N at 2 lb/ac through drip (for 30 min) on 31 July, 21 August (3 weeks after the first), and 4 September (at first bloom). Biofit contains a blend of beneficial microbes – Azotobacter chroococcum, Bacillus subtilis, B. megaterium, B. mycoides, and Trichoderma harzianum. This product is expected to improve the beneficial microbial activity in the soil and thus contribute to improved soil structure, root development, plant health, and ability to withstand stress factors. Packhard at 50 fl oz/ac in 50 gal of water as a foliar spray twice during early fruit development (on 11 and 18 September) and every 2 weeks during the harvest period (four times from 2 October to 13 November). Contains calcium and boron that improve fruit quality and reduce postharvest issues. A 50' long area was marked in the center of each plot for observations. Plant health was monitored on 1, 8, and 22 August by examining each plant and rating them on a scale of 5 where 0 represented a dead plant and 5 represented a very healthy plant. Yield data were collected from 11 October to 5 December on eight harvest dates by harvesting red tomatoes from each plot. On the last harvest date, mature green tomatoes were also harvested and included in the yield evaluation. Data were analyzed using analysis of variance and Tukey's HSD test was used for means separation. There was no statistically significant difference (P > 0.05) in the health of the plants in August (Fig. 1) or in the overall seasonal yield (Fig. 2) among treatments. The average health rating from three observations was 3.94 for the standard, 4.03 for AgSil 21, 4.45 for Yeti Bloom, 4.38 for Tech-Flo/Spray program, and 4.35 Innovak Global program. Fig. 1. 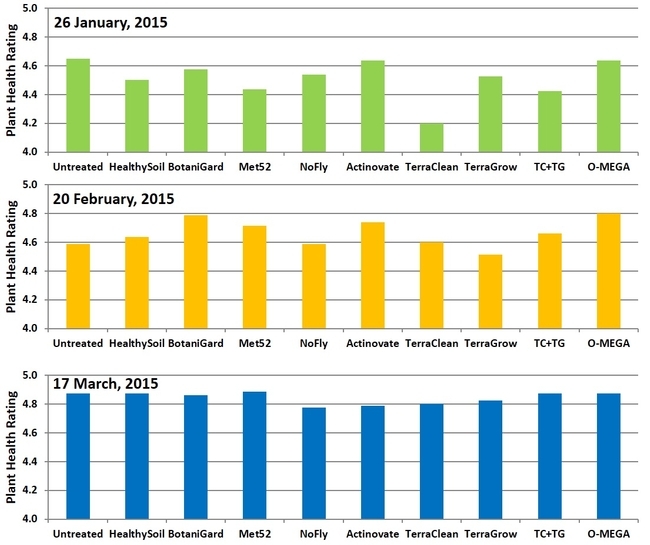 Plant health on a 0 (dead) to 5 (very healthy) rating on three observation dates. When the seasonal total yield per plot was compared, Yeti Bloom had 194.1 lb followed by, Innovak program (191.5 lb), AgSil 21 (187.3 lb), the standard (147.4 lb) and Tech-Flo/Spray program (136.5 lb). 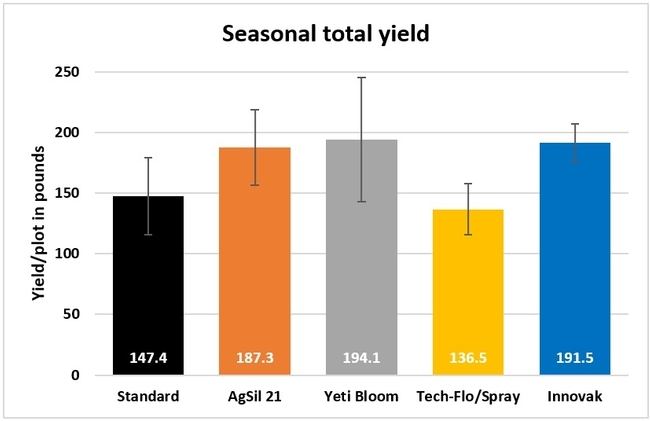 Due to the lack of significant differences, it is difficult to comment on the efficacy of treatments, but the yield from AgSil 21 was 27% more than the standard while yields from Innovak program and Yeti Bloom were about 30% and 32% higher, respectively. Fig. 2. Seasonal total yield/plot from different treatments. Fig. 3. Percent difference in tomato yield between the standard and other treatment programs. Studies indicate that plants can benefit from the application of certain minerals such as silicon compounds and beneficial microorganisms, in addition to optimal nutrient inputs. Silicon is considered as a beneficial nutrient, which triggers the production of plant defense mechanisms against pests and diseases (Bakhat et al., 2018). Although pest and disease conditions were not monitored in this study, silverleaf whitefly (Bamisia tabaci) infestations and mild yellowing of foliage in some plants due to unknown biotic or abiotic stress were noticed. AgSil 21 contains 26.5% of silica as silicon dioxide and could have helped tomato plants to withstand biotic or abiotic stress factors. Similarly, beneficial microbes also promote plant growth and health through improved nutrient and water absorption and imparting the ability to withstand stresses (Berg, 2009; Shameer and Prasad, 2018). Beneficial microbes in Yeti Bloom and BiofitN might helped the tomato plants in withstanding stress factors and improved nutrient absorption. Other materials applied in the Innovak program might have also provided additional nutrition and sustained microbial activity. The scope of the study, with available resources, was to measure the impact of various treatments on tomato crop health and yield. Additional studies with soil and plant tissue analyses, monitoring pests and diseases, and their impact on yield would be useful. Acknowledgements: Thanks to Veronica Sanchez, Neal Hudson, Sean White, and Sumanth Dara for their technical assistance and the collaborating companies for free samples or financial assistance. Bakhat, H. F., B. Najma, Z. Zia, S. Abbas, H. M. Hammad, S. Fahad, M. R. Ashraf, G. M. Shah, F. Rabbani, S. Saeed. 2018. Silicon mitigates biotic stresses in crop plants: a review. Crop Protection 104: 21-34. DOI: 10.1016/j.cropro.2017.10.008. Berg, G. 2009. Plant-microbe interactions promoting plant growth and health: perspectives for controlled use of microorganisms in agriculture. Appl. Microbiol. Biotechnol. 84: 11-18. DOI: 10.1007/s00253-009-2092-7. Chandra, D., A. Barh, and I. P. Sharma. 2018. Plant growth promoting bacteria: a gateway to sustainable agriculture. In: Microbial biotechnology in environmental monitoring and cleanup. Editors: A. Sharma and P. Bhatt, IGI Global, pp. 318-338. Shameer, S. and T.N.V.K.V. Prasad. 2018. Plant growth promoting rhizobacteria for sustainable agricultural practices with special reference to biotic and abiotic stresses. Plant Growth Regulation, pp.1-13. DOI: 10.1007/s10725-017-0365-1. Various soilborne, fruit and foliar diseases can affect strawberry crop and fruit yields. Chemical fumigants and a variety of fungicides are typically used for managing the disease issues. In addition to the environmental and human health concerns with chemical control options there is a need to improve current disease management with alternatives that include beneficial microbes. Previous studies showed some promise with some of the treatments, but additional studies are required to evaluate the efficacy, which is more evident especially when there is disease incidence. Transplanting was done on 21 May, 2016 with appropriate treatments administered at the time of planting and thereafter. Study had two blocks of 10 strawberry beds (300' long) and treatments were randomly applied to a bed within each block. 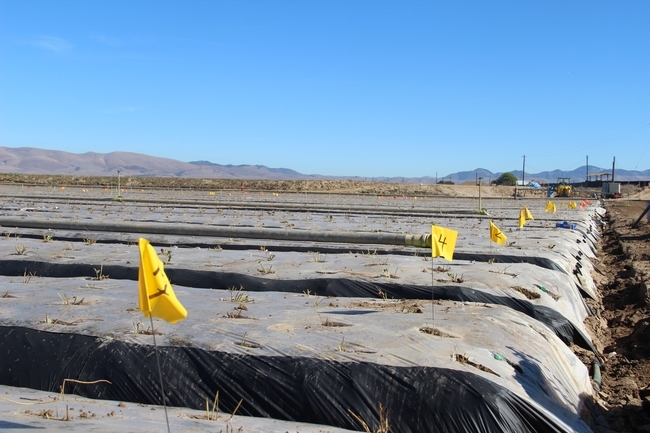 Two 15' long plots were marked within each bed for sampling. Canopy growth was measured on June 21, July 5 and 20; powdery mildew severity on August 3, September 1, October 10 and November 16; botrytis severity 3 and 5 days after harvest (DAH) for berries harvested on September 13 and 27, and October 11 and 18; and dead and dying plants were counted on September 16 and October 23. Yield data were collected from August 20 to November 18. Powdery mildew and botrytis fruit rot severity was measured on a scale of 0 to 4 where 0=No disease, 1=1-25%, 2=26-50%, 3=51-75%, and 4=76-100% severity. Data were analyzed and means were separated using LSD test. Strawberry field and plots on June 9 (above) and August 31 (below). Two sampling plots were set up within each bed to collect plant growth, health, and yield data. Canopy growth: MycoApply EndoMaxxat 2 gpa either as a transplant dip with or without drip application at planting appeared to promote significantly higher growth (P <0.0001) than MycoApply EndoMaxx at 2 and 4 gpa as drip at planting, untreated control, and grower standard. Inoculating the entire transplant with Glomus spp. through a dip appears to be better than application through drip irrigation system. Powdery mildew: Disease incidence and severity was low during the observation period. 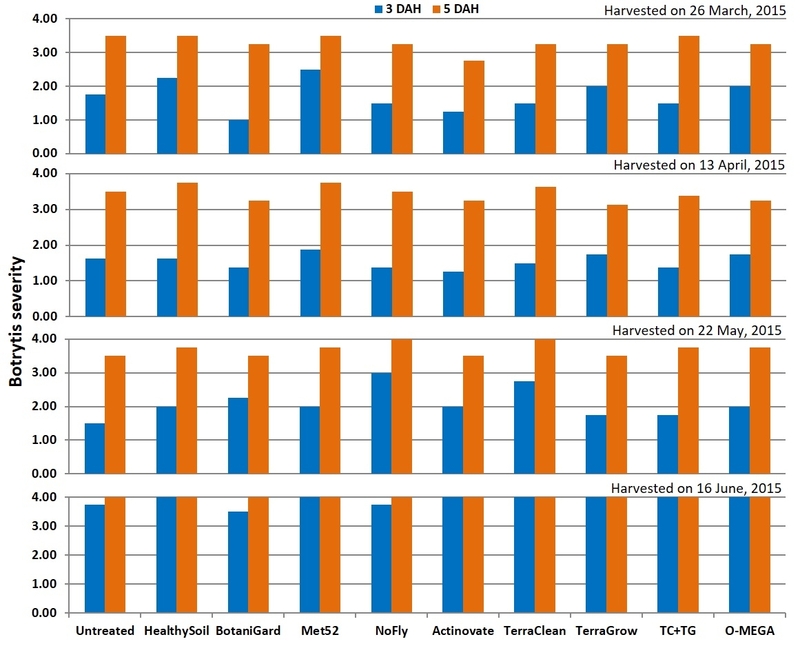 When the average of four observations period was compared, the grower standard, MycoApply Endomaxx at 2 and 4 gpa as drip at planting, and the Actinovate treatments had the lowest incidence (P = 0.0271). Botrytis fruit rot: There was no difference (P >0.05) among the treatments on botrytis when the mold growth on fruit was compared 3 and 5 days after harvest. Unknown issue: Some wilting and dead plants were found throughout the field during the study. Although symptoms suggested some kind of wilt, laboratory testing did not identify any pathogens. 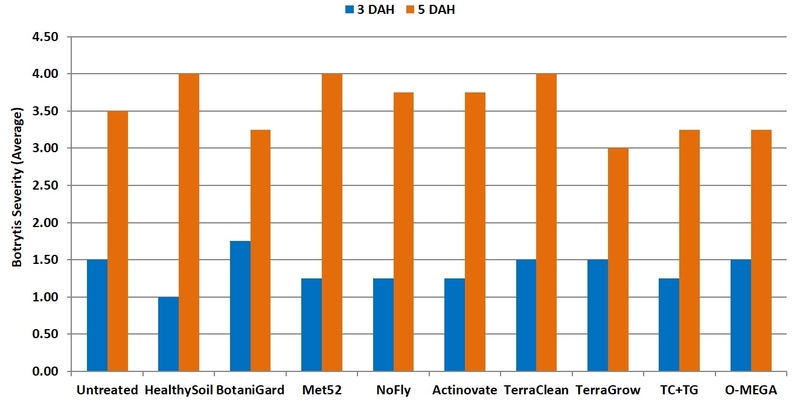 The total number of dead and dying plants was the lowest in Actinovate treatment, but it was significantly different (P = 0.0429) only from the grower standard Healthy Soil treatment. *Means followed by the same or no letter are not significantly different at the P value indicated in the table. 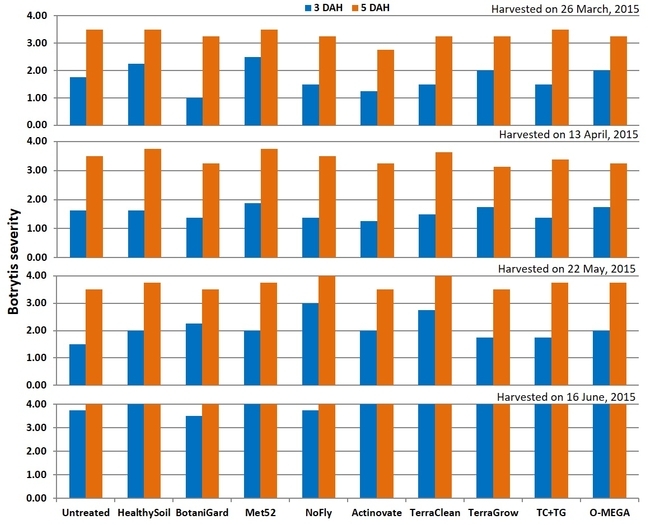 Fruit yield: There were no statistically significant difference among the treatments and the seasonal total of marketable yield varied between 66 lb/plot in the grower standard and about 76 lb/plot in MycoApply EndoMaxx applied as a transplant dip at 4 gpa. 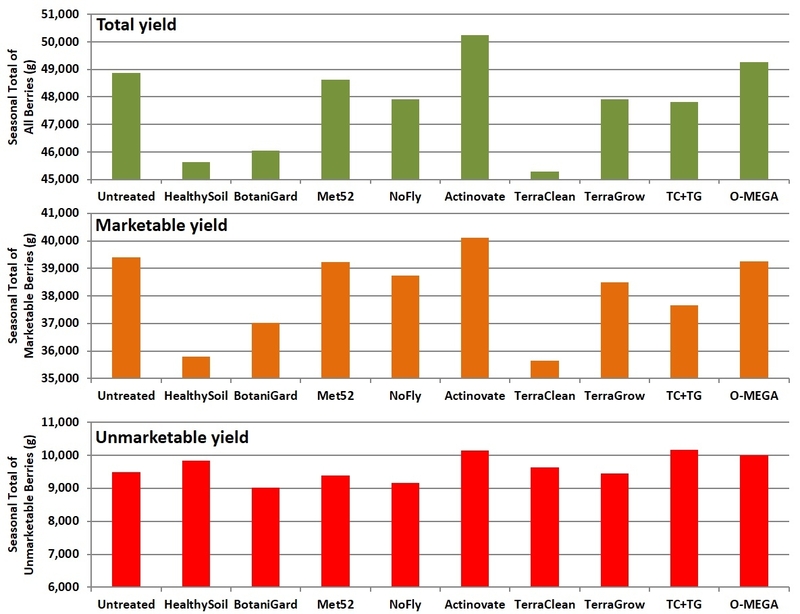 Total and marketable berry yields and their proportion among different treatments. We need to continue to evaluate beneficial microbial products and their potential benefit in improve crop health and yields. Acknowledgements: Thanks to Chris Martinez and Tamas Zold for technical assistance, and Valent USA and Inocucor Technologies for the financial support of the study. Under the soil is a complex and dynamic world of moisture, pH, salinity, nutrients, microorganisms, and plant roots along with pests, pathogens, weeds and more. A good balance of essential nutrients, moisture, and beneficial microorganisms provides optimal plant growth and yield. These factors also influence natural plant defenses and help withstand stress caused by biotic and abiotic factors. Several beneficial microbe-based products are commercially available to promote plant growth and improve health, yield potential and quality. Some of them improve nutrient and water absorption while others provide protection against plant pathogens or improve plant defense mechanism. In addition to the macronutrients such as nitrogen, phosphorus, and potassium, several micronutrients are critical for optimal growth and yield potential. Some of the micronutrient products are also useful in promoting beneficial microbes. Understanding the plant-microbe-nutrient interactions and how different products help crop production are helpful for making appropriate decisions. Mycorrhizae (fungi of roots) establish a symbiotic relationship with plants and serve as an extended network of the root system. They facilitate improved uptake of moisture and nutrients resulting in better plant growth and yield (Amerian and Stewart, 2001; Wu and Zou, 2009; Bolandnazar et al., 2007; Nedorost et al., 2014). Mycorrhizae can also help absorb certain nutrients more efficiently than plants can and make them more readily available for the plant. With increased moisture and nutrient absorption, plants can become more drought-tolerant. Mycorrhizae also help plants to withstand saline conditions and protect from plant pathogens. A healthy root system can fight soil diseases and weed invasion. Additionally, mycorrhizae increase organic matter content and improve soil structure. Considering an increasing need for fumigation alternatives to address soilborne pathogens in strawberry, mycorrhizae and other beneficial microbes could be potential tools in maintaining plant health. Additionally, recent studies suggest that entomopathogenic fungi such as Beauveria bassiana, Metarhizium brunneum, and Isaria fumosorosea form mycorrhiza-like and endophytic relationships with various species of plants and could help with plant growth and health (Behie and Bidochka, 2014; Dara et al., 2016). These fungi are currently used for pest management, but their interaction with plants is a new area of research. Understanding this interaction will potentially expand the use of the biopesticides based on these fungi for improving plant growth and health. A study was conducted at Manzanita Berry Farms, Santa Maria in fall-planted strawberry crop during the 2014-2015 production season to evaluate the impact of beneficial microbes on strawberry growth, health, mite infestations, powdery mildew, botrytis fruit rot, and yield. Untreated control: Received no supplemental treatments other than standard grower practices. BotaniGard ES: Entomopathogenic fungus Beauveria bassiana strain GHA. Rate - 1 qrt in 50 gal for a 30 min transplant dip and 1 qrt/ac every 15 days until January and once a month thereafter until April, 2015. Met52: Entomopathogenic fungus Metarhizium brunneum strain F52. Rate – 16 fl oz in 50 gal for a 30 min transplant dip and 16 fl oz/ac every 15 days until January and once a month thereafter until April, 2015. NoFly: Entomopathogenic fungus Isaria fumosorosea strain FE9901. Rate – 11.55 oz in 50 gal for a 30 min transplant dip and 11.55 oz/ac every 15 days until January and once a month thereafter until April, 2015. Actinovate AG: Beneficial soilborne bacterium Streptomyces lydicus WYEC 108. Rate – 6 oz in 50 gal for a 30 mintransplant dip and 6 oz/ac every month. TerraClean 5.0: Hydrogen dioxide and peroxyacetic acid. Rate – 1:256 dilution for a 1 min root dip followed by 2 gal/ac 10 days after planting and then 2 and 1 gal/ac alternated every 15 days until April, 2015. TerraGrow: Humic acids, amino acids, sea kelp, glucose based carriers, bacteria – Bacillus licheniformis, B. subtilis, B. pumilus, B. amyloliquefaciens, and B. magaterium, and mycorrhizae – Trichoderma harzianum and T. reesei. Rate – 1.13 g in 10 gal for a 1 min root dip followed by 1.5 lb/ac 10 days after planting and once every month until April, 2015. 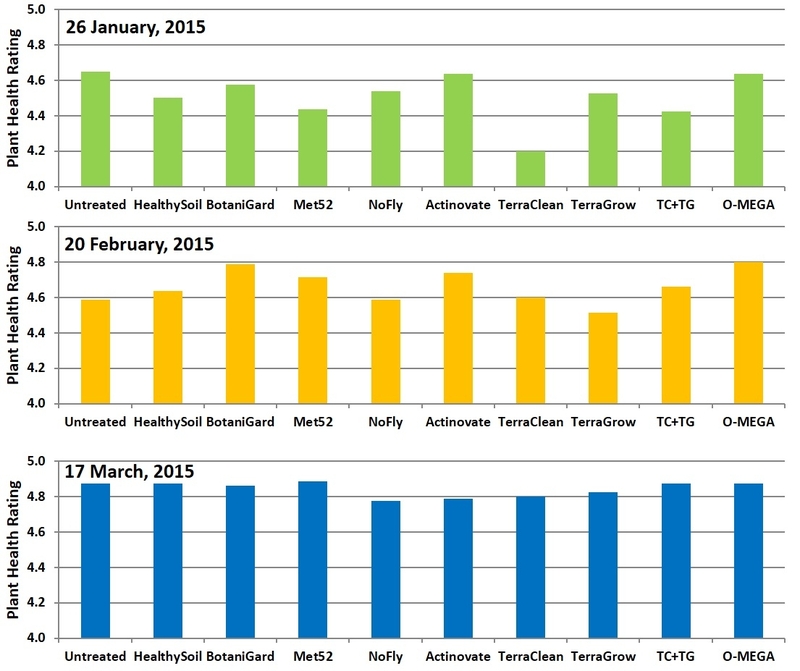 TerraCelan and TerraGrow: Same as individual treatments at the time of planting, but TerraClean at 2 gal/ac and TerraGrow at 1.5 lb/ac 10 days after planting followed by monthly treatments until April, 2015. O-MEGA: NPK (0.2-1.0-0.5), bacteria – Azotobacter chroococcum, Azospirillum lipoferum, Lactobacillus acidophilus, Pseudomonas fluorescens, Cellulomonas cellulans and the fungus Aspergillus niger. Rate – 20 ml in 1 gal sprinkled on transplants 30 min before planting followed by 1 qrt/ac every week rest of the season. 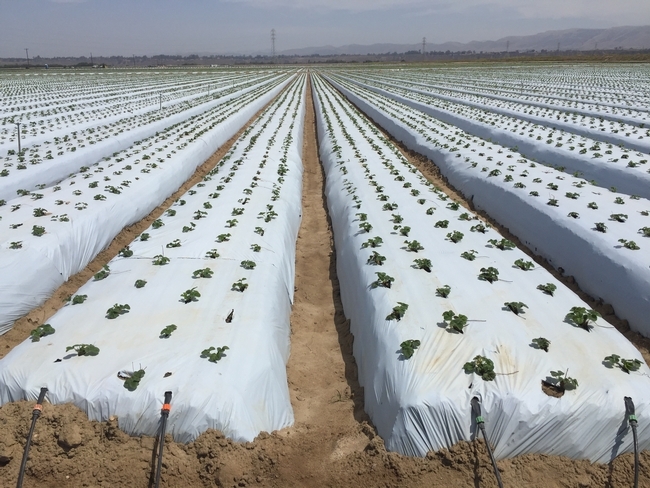 Strawberry transplants (variety BG-6.3024) were treated at the time of planting on 6 November, 2014 and treatments are also administered periodically through the drip irrigation system following the abovementioned schedule. Each treatment had two 330' long beds each with four rows of plants. Treatments were randomly arranged in two blocks and two sampling plots (20' long) were established within each bed in a block. 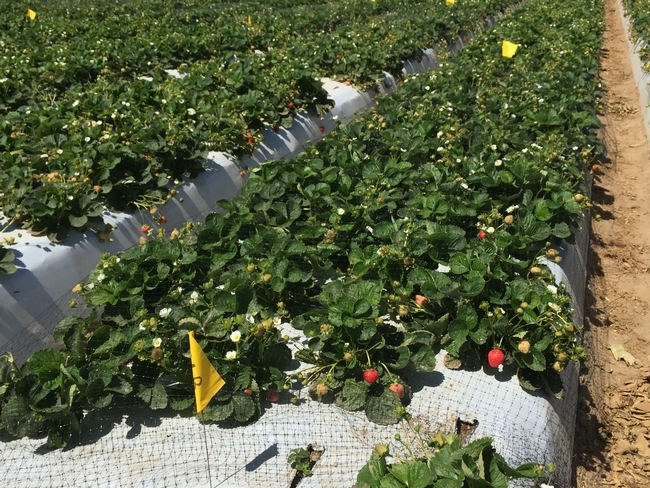 The impact of the treatments on plant growth (canopy size), health, spider mite populations, botrytis and powdery mildew severity, and yield were monitored periodically. Plant growth was determined by measuring the canopy size. Plant health was rated on a scale of 0 to 5 where 0=dead, 1=weak, 2=moderate low, 3=moderate high, 4=good, and 5=very good. Powdery mildew severity was determined by observing leaf samples under microscope and rating the severity on a scale of 0 to 4 where 0=no infection, 1=1-25%, 2=26-50%, 3=51-75%, and 4=76-100% of leaf area with powdery mildew. Twenty plants or leaf samples per plot were used for these observations. To monitor botrytis fruit rot, a box of fruits from each plot were held at room temperature and disease was rated 3 and 5 days after harvest on a scale of 0 to 4 where 0=no infection, 1=1-25%, 2=26-50%, 3=51-75%, and 4=76-100% of fruit with botrytis. Yield data were also collected from the plots throughout the production season using grower's harvesting schedule. Mite counts were also taken periodically. Data were analyzed using analysis of variance and significant means were separated using Tukey's HSD means separation test. 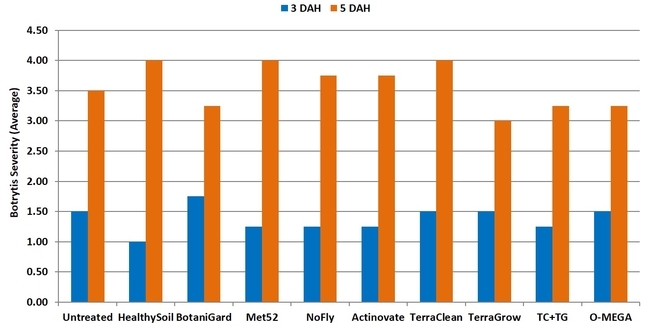 Canopy size: Significant differences (P = 0.002) among treatments were seen only on the first observation date on 26 January, 2015 where TerraClean-treated plants were smaller than some of the treatments. There were no significant differences (P > 0.05) in treatments on the following observations in February and March, however TerraClean-treated plants recovered and plants were larger in some of the treatments. Size of the plant canopy on three observation dates. Plant health: Treatments did not have a significant (P > 0.05) impact on plant health. Health ratings varied from 4.2 for TerraClean to 4.6 for untreated, BotaniGard, Actinovate, and O-Mega treatments in January. 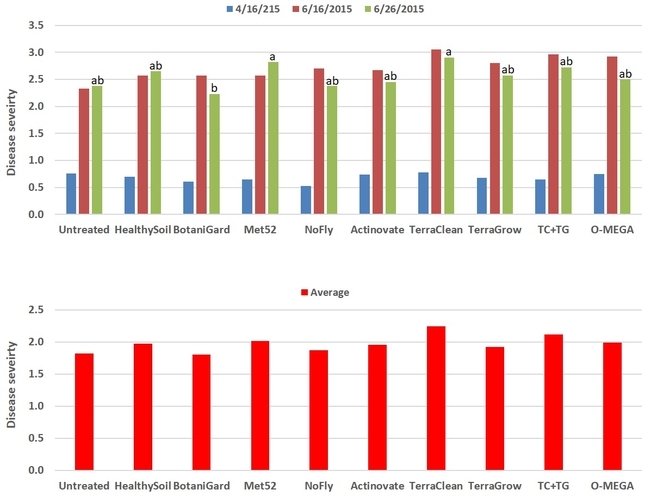 In February, TerraGrow-treated plants had 4.5 rating and BotaniGard and O-Mega treatments had 4.8. March ratings varied between 4.8 and 4.9 in all the treatments. As there were no soilborne diseases during the study period, the impact of the treatments could not be determined, which was the main objective of the study. 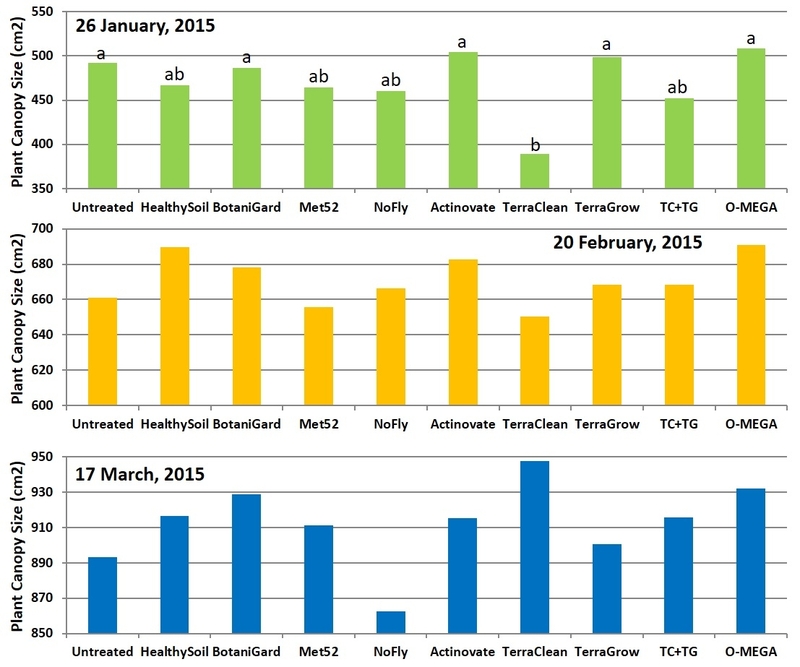 Plant health ratings on three observation dates. Powdery mildew: Disease severity did not differ among treatments (P > 0.05) on 16 April and 16 June, but significant (P = 0.008) differences were observed on 26 June where BotaniGard-treated plants had the lowest. 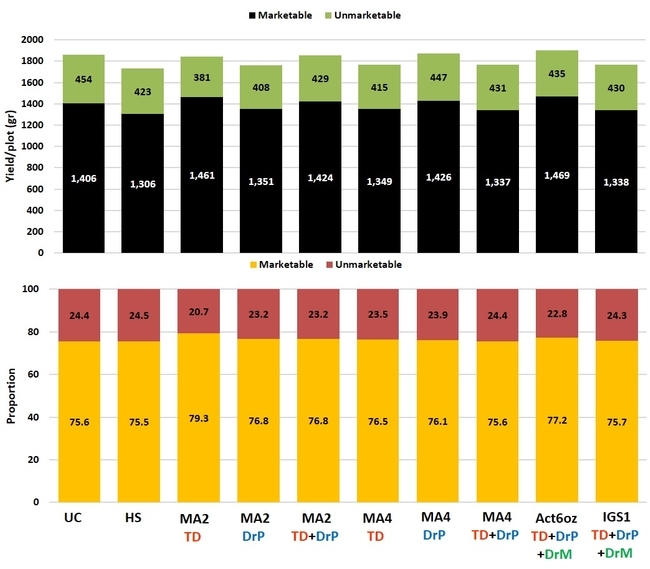 When data were compared for the three observation dates, severity rating varied from 1.8 for BotaniGard to 2.24 for TerraClean. Botrytis fruit rot: There were no significant (P > 0.05) differences among treatments on any of the four observation dates or when data were combined for all observations. In general, fruit rot was less severe 3 days after harvest than 5 days after during the first three observation dates. 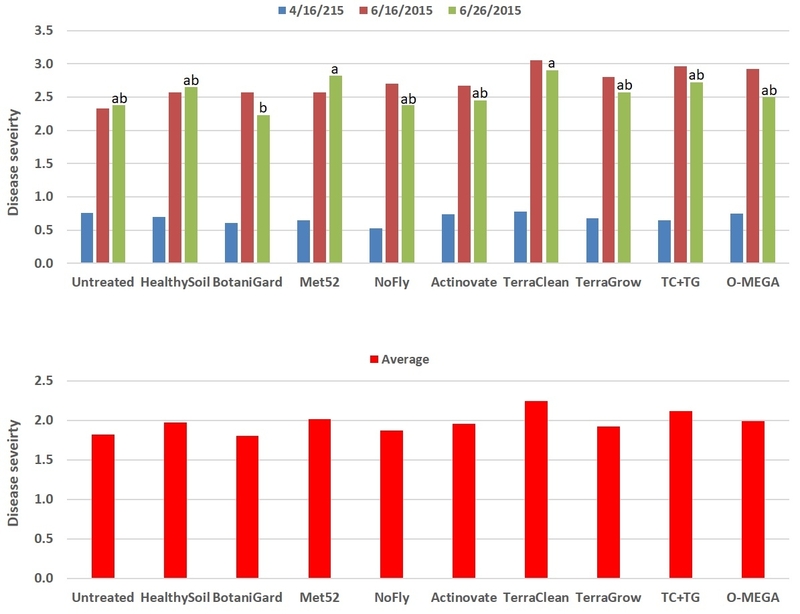 When data were combined for the observation dates, HealthySoil treatment had a rating of 1 followed by Met52, NoFly, Actinovate, and TerraClean+TerraGrow with a 1.3 rating for 3 days after harvest. Severity of botrytis fruit rot 3 and 5 days after harvest on individual observation dates (above) and when data were combined (below). Spider mites: Mite populations were very low in all the plots during observation period and data were not included. Fruit yield: While the seasonal yield of total, marketable, or unmarketable berries was not significantly (P > 0.05) different for any of the treatments marketable yields had a wider range than unmarketable yields among treatments. The lowest marketable fruit yield was seen in TerraClean (35.6 kg or 79.4 lb) and HealthySoil (35.8 kg or 79.8 lb) while the highest yield was seen in Actinovate (40.1 kg or 89.4 lb) followed by untreated control (39.4 kg or 87.9 lb), O-Mega (39.3 kg or 87.6 lb), Met52 (39.2 kg or 87.4 lb), and NoFly (38.7 kg or 86.3 lb) treatments. Seasonal yields of total, marketable, and unmarketable strawberries per plot. 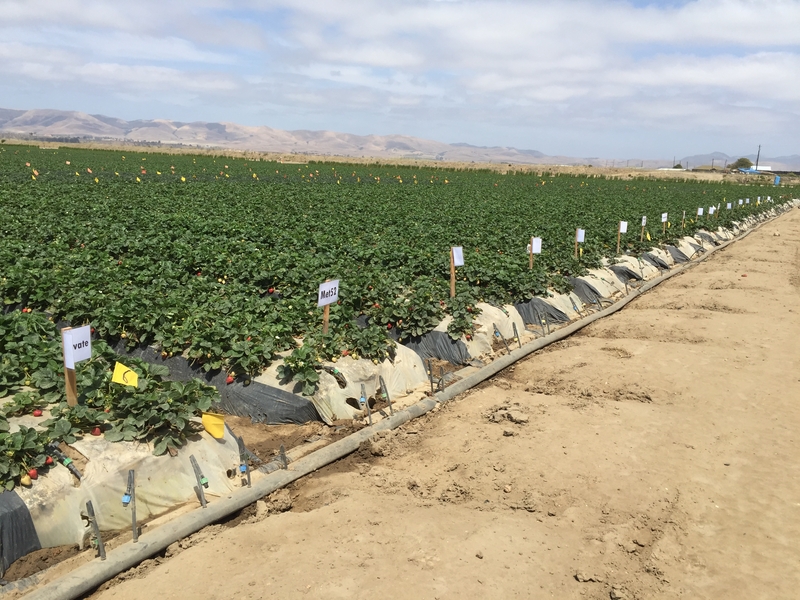 This is the first field study evaluating the impact of three popular entomopathogenic fungi along with multiple beneficial microbes on strawberry plant growth, foliar and fruit diseases, and yield. While differences among treatments were not pronounced, it appeared that some had a positive impact on some of the parameters measured. It is interesting to note that yields were higher (although not statistically significant) than the grower standard, HealthySoil. 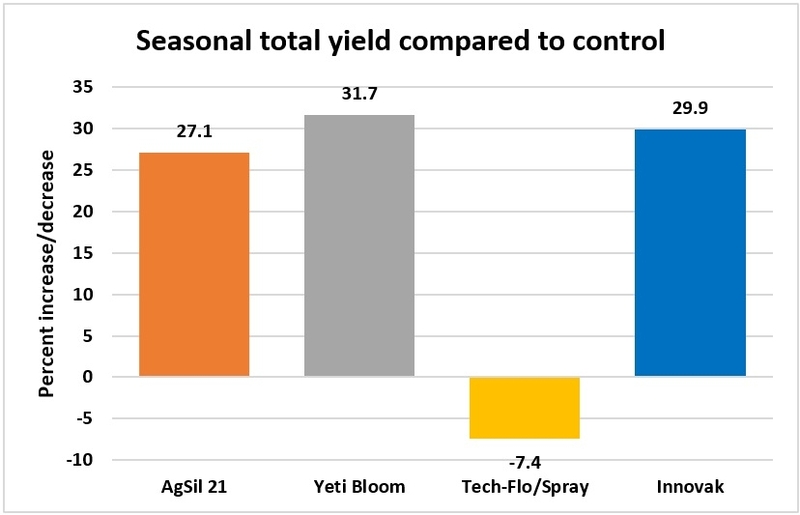 Compared to the grower standard, marketable yield was higher in many other treatments. Since an untreated situation is not common in a commercial field, using beneficial microbes can be useful. Although previous field studies evaluated the impact of with the entomopathogenic fungus B. bassiana in strawberries (Dara, 2013; Dara, 2016), a positive impact on plant growth or yield by I. fumosorosea and M. brunneum in commercial strawberries has never been reported earlier. Additional studies with different application rates would be useful to understand how beneficial microbes could be exploited more. Acknowledgments: Thanks to Dave Peck, Manzanita Berry Farms for the collaboration and industry partners for the financial support. Thanks to Chris Martinez and rest of the field crew at Manzanita Berry Farms and Fritz Light and Tamas Zold for the technical assistance. Amerian, M.R., and W.S. Stewart. 2001. Effect of two species of arbuscular mycorrhizal fungi on growth, assimilation and leaf water relations in maize (Zea mays). Aspects of Appl. Biol. 63: 1-6. Behie, S.W., and M.J. Bidochka. 2014. Nutrient transfer in plant-fungal symbioses. Trends in Plant Sci. 19: 734-740. Bolandnazar, S., N. Aliasgarzad, M.R. Neishabury, and N. Chaparzadeh. 2007. Mycorrhizal colonization improves onion (Allium cepa L.) yield and water use efficiency under water deficit condition. Sci. Horticulturae 114: 11-15. Nedorost, L., J. Vojtiskova, and R. Pokluda. 2014. Influence of watering regime and mycorrhizal inoculation on growth and nutrient uptake of pepper (Capsicum annuum L.). VII International symposium on irrigation of horticultural crops, Braun P., M. Stoll, and J. Zinkernagel (eds). Acta Horticulturae 1038:559-564. Wu, Q.S., and Y. Zou. 2009. Mycorrhizal influence on nutrient uptake of citrus exposed to drought stress. Philippine Agri. Scientist 92: 33-38.